Today's installment of In the Kitchen with Zombie Fiction features the zombie film that started it all for me, Shaun of the Dead. It kicked off my love affair with the fabulously funny and clever due that is Simon Pegg and Nick Frost, but also my appreciation for zombie stories that don't necessarily center around the zombies, but rather, the people trying to stay human. 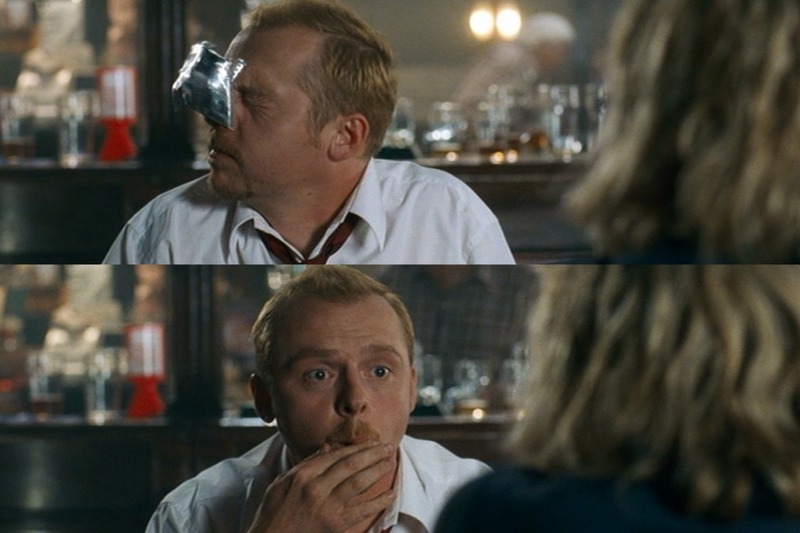 If by some chance you haven't seen Shaun of the Dead, go ahead and watch it...I'll wait. Okay, I'm kidding. Sort of. You really should go watch it, but until then, I'll give you a quick rundown. Shaun and Ed are best mates in their 20's who haven't really made that transition to responsible adult yet. Much to Shaun's girlfriend Liz's chagrin, Shaun would rather sleep late, play video games, get his meals one-by-one at a convenience store, and hang out at The Winchester (a pub), than start adulting. Liz calls things off with Shaun after he lets her down one time too many. Have a nice cold pint. Wait for this all to blow over. But things in a zombie apocalypse are never that simple, and we're treated to plenty of comedy and zombie-killing along the way. That's the basics. We lose a lot of the cast by the time the movie is over (but I won't say who, just in case you are planning on checking it out for the first time now). As far as food inspiration goes, there's actually quite a bit both seen and mentioned throughout, but I think Shaun of the Dead deserves a solid pub menu to do it justice. I actually plan on putting a menu together and posting a new recipe from it until it's complete (though that may take some time). Aside from normal pub munchies like pork rinds (aka pork lumps or pig snacks), crisps, and corn nuts (more about these in a minute), I'll include toasties (toasted sandwiches), homemade giant pickles like the kind you see in a huge jar on/behind bars (because Shaun's mum calls him "Pickle"), fried cheese slices (from the quote "How's that for a slice of fried gold? "), and of course, Cornettos (probably more recognizable as Drumsticks to us Americans) and red pie ("you've got red on you") in case of a sweet tooth. 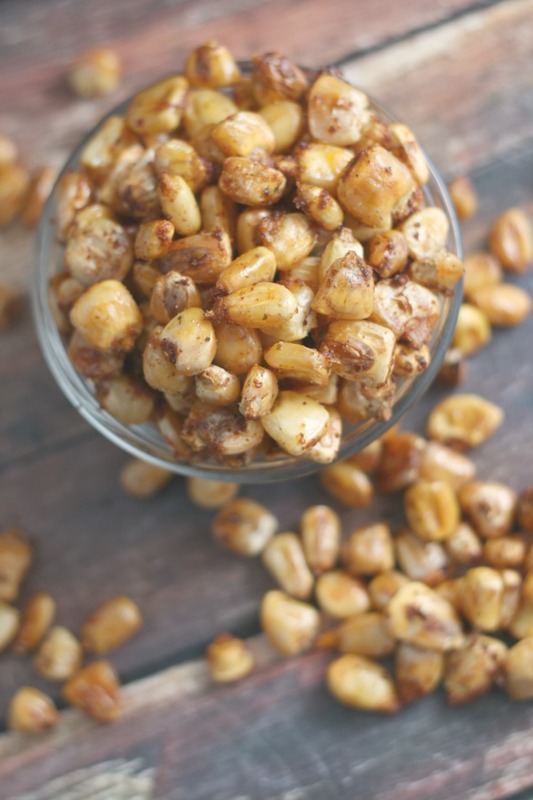 Giant corn kernels spiced with ranch seasoning and smoky paprika, then roasted until crunchy. 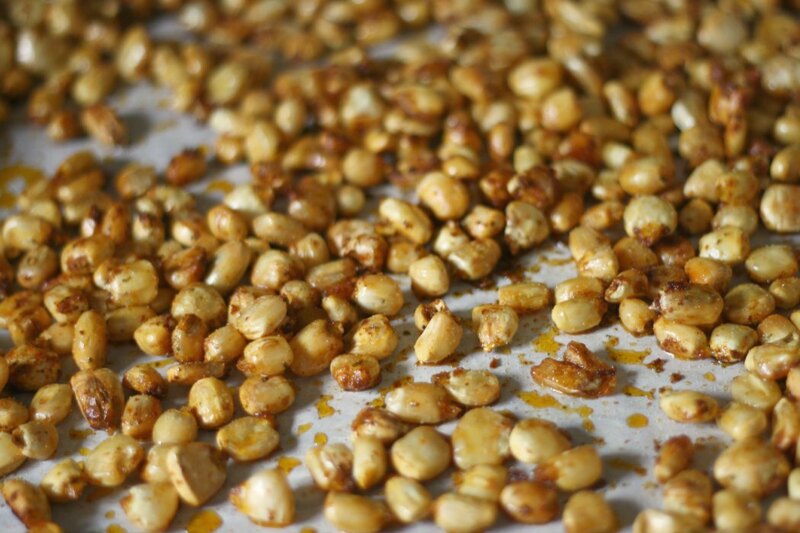 So, I'll kick things off today with the homemade corn nuts. 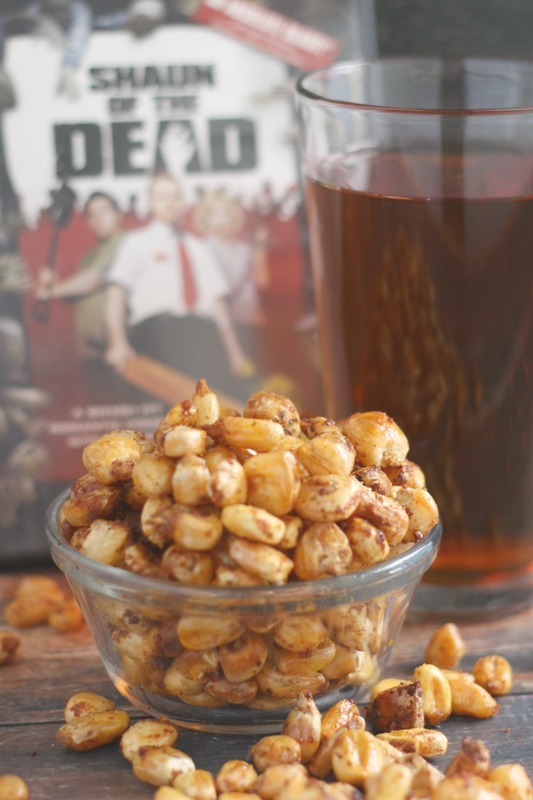 Funny story - corn nuts are never actually mentioned or seen in Shaun of the Dead. But I thought they were up until a few days ago. You see, in the opening scene at The Winchester, Ed beans Shaun in the head with a bag, and what I've always heard as he threw it was "Shaun! 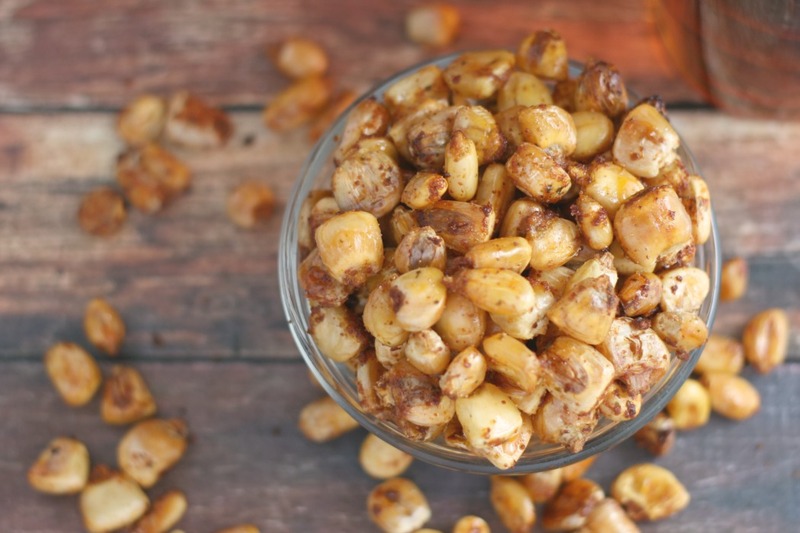 Corn nuts!". But when I turned on the subtitles, it turns out what Ed actually says is "Shaun! Hog lumps!". Oops. But hey, both good pub snacks, amiright? Obviously I should have turned on subtitles before heading into the kitchen, but I didn't, and thus, corn nuts. I promise I'll make up for it by creating each item on that menu as time goes on! 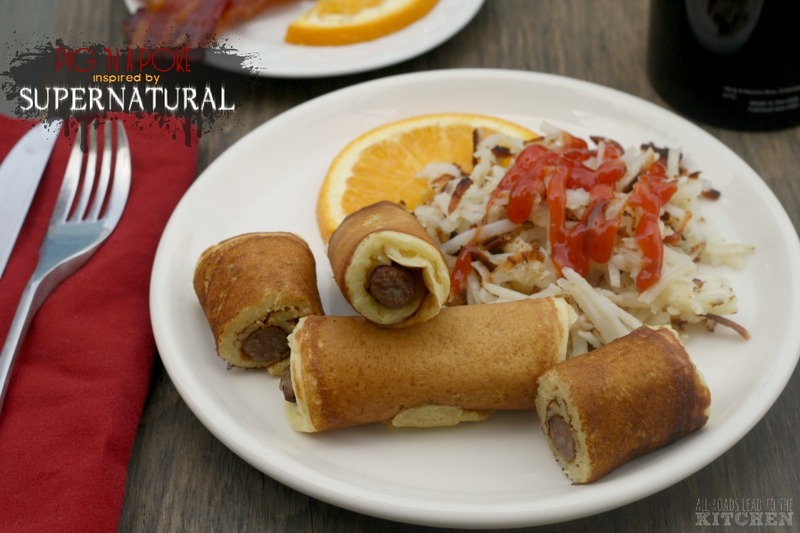 Also,my friend Kimberly from Coffee and Casseroles is joining me in the kitchen with Shaun of the Dead this month, so I'll hope you'll drop by and check out her Shaun of the Dead inspired Zombie Skins with You've Got Red on You Sauce! This is part of my "in the kitchen with Zombie Fiction" series, which features food pulled from or inspired by different works of zombie fiction. I'll be sharing at least one new recipe from this series every month. 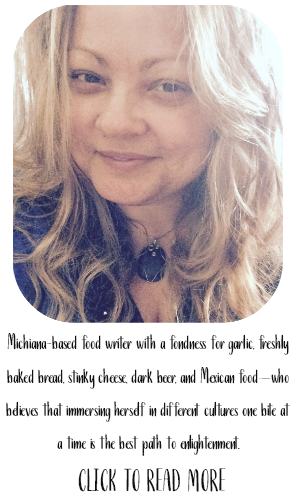 To check out all of the past recipes and some upcoming featured titles, check out my "in the kitchen with Zombie Fiction" page! 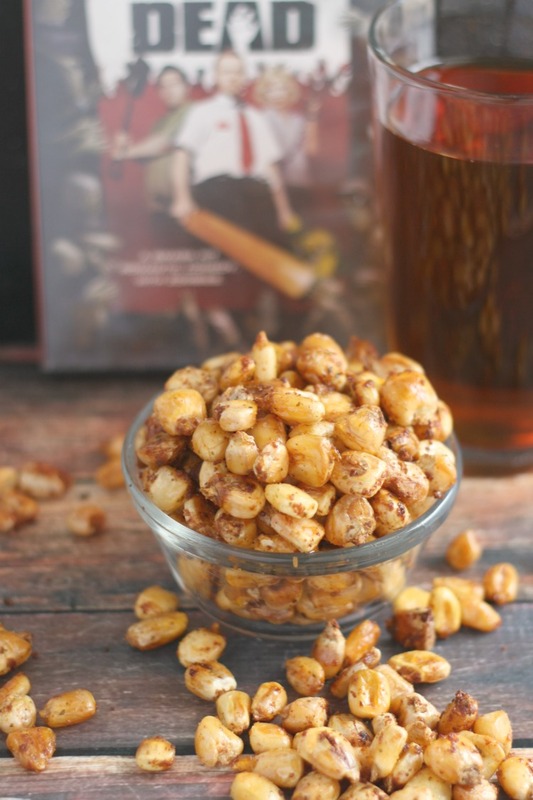 Crunchy, roasted, spiced corn snacks perfect for munching alongside a pint. 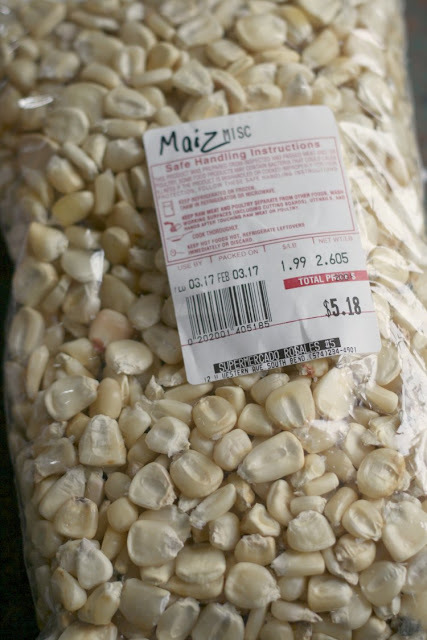 Rinse the dried corn and place it in a large bowl, then cover with water by a couple of inches. 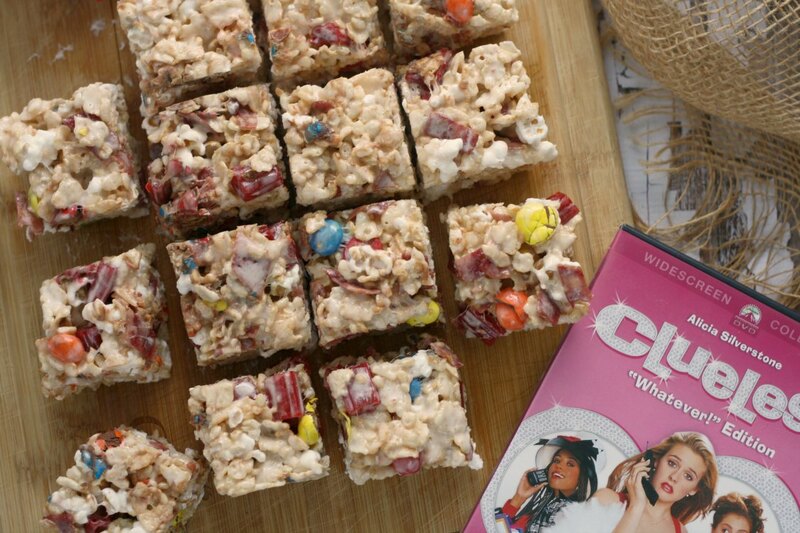 Cover with plastic wrap and store in the fridge or at cool room temperature for 24 to 36 hours. Dump the bowl into a collander set over the sink; shake it around. Let sit in the collander in a cool room for 4 hours, tossing and shaking from time to time, until no longer wet. Alternately, you could use a towel to pat them dry if you're in a hurry. Pour the now-dry, but rehydrated, kernels into a dry bowl. Drizzle with oil, then shake the ranch seasoning and smoked paprika over them. 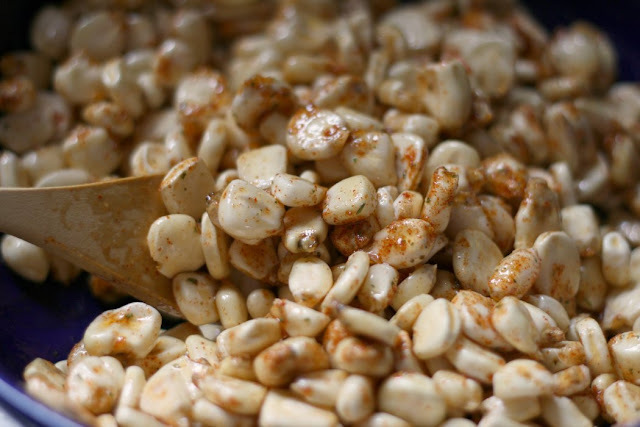 Use a wooden spoon to stir around until all of the kernels are evenly coated. Pour out onto prepared baking sheet, scraping any seasoning from the bowl along with the kernels. Spread into a single layer. 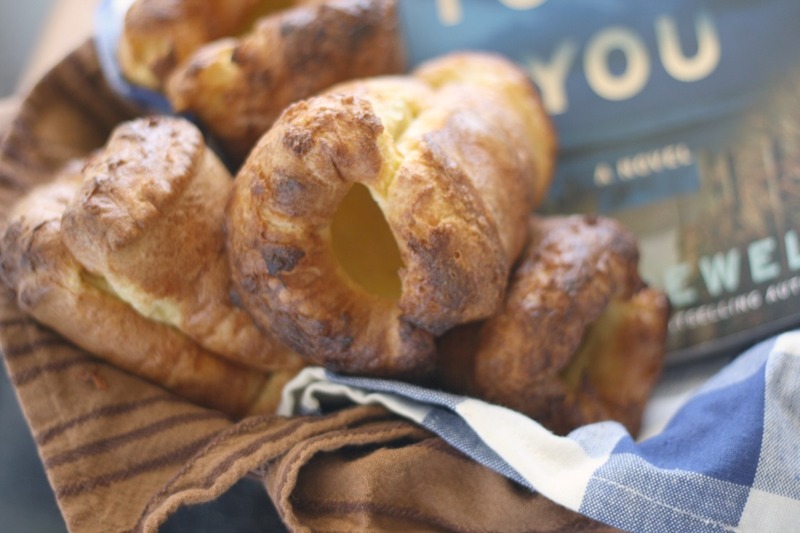 Slide into preheated oven and roast for 30-40 minutes, stirring 2 or 3 times during that time, until golden and puffed—you might hear a few kernels "pop" in the oven, but that's okay. Remove from oven, sprinkle lightly with a little sea salt, then allow to cool completely before enjoying. Feel free to season your corn nuts however you like by substituing other seasoning and/or spices for the ranch and smoked paprika. 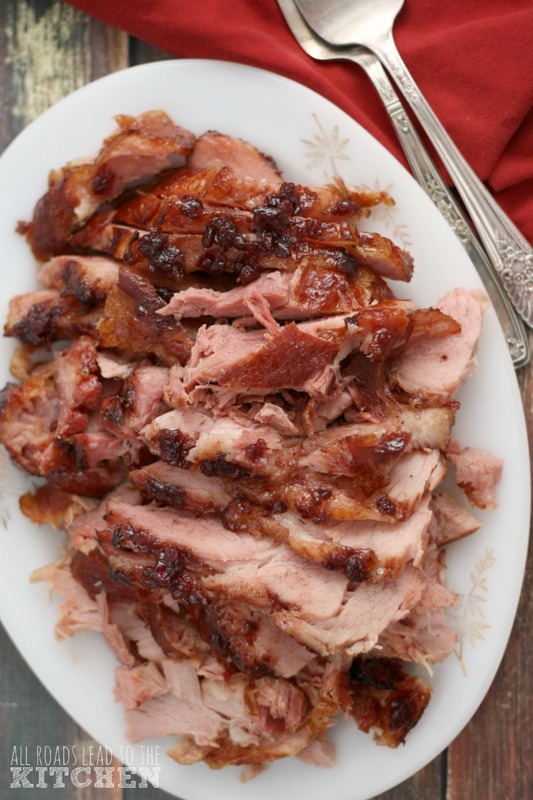 Or, simply toss with salt or a salt-n-pepper mix. 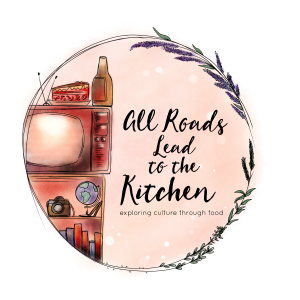 ©All Roads Lead to the Kitchen. Adapted from Food52.